Domenic and I got engaged March 3rd, 2018. It was the best day of our lives! Any free weekend we get in Northern Illinois we always go hiking at Starved Rock State Park. It is one of our favorite places. Back in February we hiked a new trailed called Ottawa Canyon. It was the first time we had been back there. The waterfall was frozen at the time but it was such a cool sight to see. In my head I had told myself that this would be such a neat place for Domenic to propose. About a month later Domenic was traveling for work and he called me on a Thursday night and asked if I wanted to go hiking in Ottawa Canyon again. Since we had nothing going on Saturday of course I said yes. That morning we got up and packed the backpack and our dog Daisy and headed out to the park. It was a cooler morning but we both just had light jackets on. We made our journey back to a couple other canyons in the area before ending up back at Ottawa Canyon. We stopped at a tree that had fallen and Domenic pulled out this GoPro to take a picture of us. We continued walking back to Ottawa Canyon. We let the dog play around in the water for a while before Domenic said we should take another picture since the waterfall wasn’t frozen anymore. I agreed and he went to set up the GoPro. After setting it up he walked over to me and the dog and looked at me and started smiling. His exact words were, “You know why I brought you here right?” Domenic ALWAYS joked about how he was going to propose. That he was going to do it in our kitchen or he was going to bend down and act like he was proposing but really he was tying his shoe. I thought he was joking so I stared shaking my head no. When he got down on one knee and pulled out the ring box I knew he was serious. I as in complete shock! I couldn’t believe that I had finally found someone that wanted to spend the rest of his life with me. We hugged and I asked if he had gotten a picture of it since the GoPro was still set up. He said, “No, I got something better.” He had gotten the whole thing on video. It was so perfect! We left the park and headed for home to tell everyone the good news. When we got home Domenic edited the video of the proposal because all you could hear in the original was the waterfall and the sound of me bawling. He found a song and added it to the video to cover up the noise. 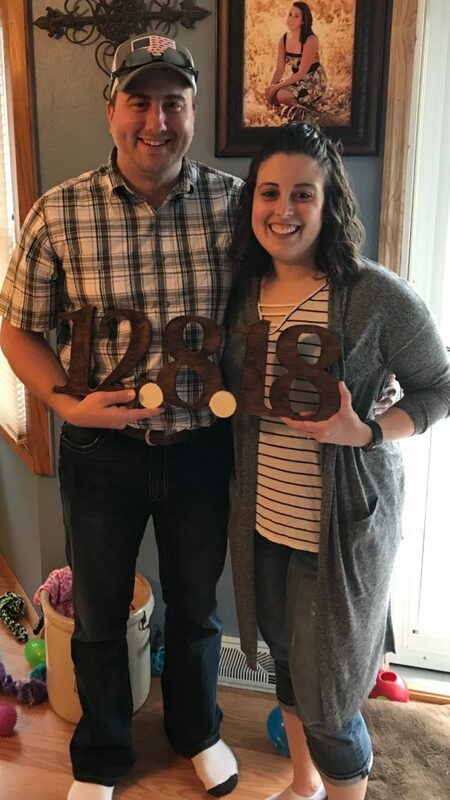 We decided on December 8th, 2018 for our wedding. I have always loved the winery but I never pictured myself getting married there. Domenic and I went and looked at the new building they had just put up and we instantly fell in love. It was everything we had hoped for. We can’t wait for our big day and our perfect get away honeymoon! What a beautiful and romantic love story!